This course on coaching and mentoring uses a conversational technique to introduce the content. Instead of a single narrator reading bullet points in a list, I used two characters who explain the content via a conversation. A short video at the beginning of the course introduces the characters and shows the challenge the protagonist, new manager Michael, faces while coaching one of his employees. The course content is delivered via a conversation between Michael and his mentor, Pamela. Essentially, learners watch over Michael’s shoulder during his coaching session with Pamela. 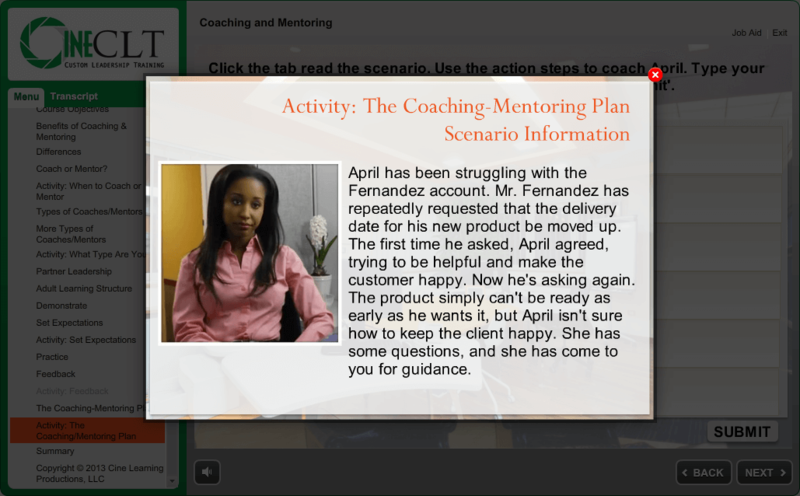 The practice activities use mini-scenarios or personal reflections so learners apply their new skills in a realistic context. This course is part of Cine Learning Productions Custom Leadership Training (CLT) program and is shared here with their gracious permission.